Mr. Warren is a principal with the firm and, since 1989, has concentrated his practice in the area of matrimonial law. A significant part of his practice involves analysis of complex financial issues, business and real estate valuation, and cash flow analysis in connection with matrimonial matters. He is a graduate of the American Bar Association Family Law Institute and is rated AV by Martindale-Hubbell. He has lectured frequently in the field of domestic relations and has authored numerous articles regarding developing case law and issues concerning child support and maintenance. 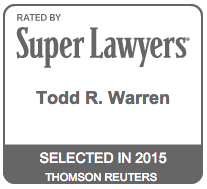 Mr. Warren is recognized by his peers and the judiciary as being a tireless advocate for his clients. Practicing in one of the most difficult areas of the law, clients have long appreciated Mr. Warren’s steady hand and clinical approach to favorably resolving their many problems and issues. He is known for his thoughtful and effective problem solving and his ability to take a highly charged complex situation and turn it into a positive result. When clients are represented by Mr. Warren, their questions are answered, their problems are heard, and their needs are addressed with the highest priority and importance. Mr. Warren is a member of the Lake County Bar Association, Lake County Family Law Committee, Lake County Family Conciliation Review Committee, Chicago Bar Association, Illinois State Bar Association and American Bar Association, Family Law Section Sub-Committees on Maintenance and Child Support. He is also an arbitrator in Lake County, Illinois and a member of the Volunteer Lawyers Program. Mr. Warren is licensed to practice law in the State of Illinois and the United States District Court, Northern District of Illinois. Mr. Warren received his Bachelor of Science degree in Business from Indiana University in 1986 and his Juris Doctor degree from DePaul University College of Law in 1989. Mr. Warren was named to the Best Lawyers in America since 2013, named one of the “Top 40 Under 40 Illinois Attorney,” 2004 by the Illinois Law Bulletin, and named in the top 5% of attorneys in the field of domestic relations in the State of Illinois by the Leading Lawyers Network, 2003 to present. He has also been recognized as a “Super Lawyer” by the Law and Politics Magazine, 2005 to present, and is rated AV Preeminent for Ethical Standards and Legal Ability by Martindale-Hubbell. Previously, Todd served as an Adjunct Professor at DePaul University College of Law teaching “How to Run a Family Law Practice.” Additionally, he has lectured frequently in the field of domestic relations and authored numerous articles regarding developing case law and issues concerning child support and maintenance.